There’s a video going around of professor of journalism at UC Berkeley Graduate School of Journalism Michael Pollan giving a talk about a number of things: the relationship between cooking and health, the changing cultural perceptions and role of cooking over time, the rise of processed foods, our heavy reliance upon food corporations, and McDonald’s french fries. I don’t find what he argues particularly profound or groundbreaking but I do agree with some of what he says. He argues, among other things, that cooking is the simplest and easiest way to improve health. This is something I’ve come to realise very quickly upon starting on my own cooking adventure because I came to see how much butter actually goes into that chocolate cake and how much salt I end up using to season my food. Sometimes it’s scary how much fat, salt or sugar I use – and if you’ve followed my blog for a while you’ll notice I’ll always try and lessen the amount of sugar or fat used, especially in desserts – but this makes not being able to see for myself what’s going into my food when I buy takeaways or fast food even scarier. Pollan points out that corporations cook very differently to individuals. Of course they do. Mass produced food is laden with salt, fat, sugar, additives, preservatives – how else are they going to make it taste good, withstand a long shelf-life and most importantly, make money? The increased reliance upon processed foods means people are eating stuff that’s not great for them more often. Pollan uses the example of fries. 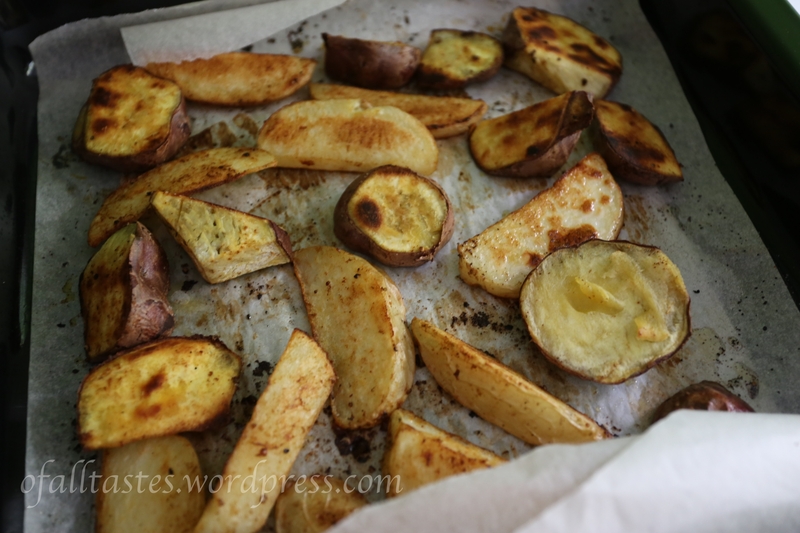 Instead of having to wash, peel, cut and bake/fry potatoes to make fries, you can just buy a frozen bag full of yummy potato and pop it straight into the oven or deep fryer. Less work, less mess to clean up. I’m absolutely guilty of this, especially with regards to fries. I remember having frozen fries at home from when I was at primary school and only in recent years have I stopped turning to them regularly as a snack or make-do meal when there’s nothing else to eat. As an aside, some of you may wonder why my parents let me eat those things in the first place and well, I guess they just didn’t think they were that bad. Potato doesn’t feature all that much in Chinese cuisine and I think they figured they didn’t look or taste all that harmful. They were easy to rustle up and I loved them. Once I discovered how delicious hand-cut, oven-baked potato fries and wedges could be though, I found it harder and harder to pull out that greasy bag of McCain chunky cut chips from the freezer. Admittedly, it does take more work and more cleaning up but it’s infinitely more satisfactory. Peel ’em or don’t, cut ’em anyway you want, fry ’em or bake ’em, season with your own herbs and spices, serve with a main meal or have ’em on their own. They’re yours for the taking. « Got too many carrots? Make a pie!